A long time ago, deep in the mists of time, before my back decided to give up the ghost I set my S2 German class a task to produce podcasts in which they would explain the finer points of a particular grammar item. The idea was that the podcast (or Grammcast as I have termed them) would help fellow German learners grasp that point. Due to my recent incapacity this never got finished, until now. This week I have recorded these Grammcasts and am going to post them on RateMyMates for the kids to assess them. I recorded them without checking the scripts for accuracy, mainly because I have plans for the class next week and wanted to get their work published. This decision has thrown up what I hope to be a nice little teaching point, as in one or two of the podcasts there are some quite glaring errors. When I ask the class to listen to and assess their mate's work I want them to try to identify those mistakes (sensitively) and then come back and re-record the podcasts grammcasts accurately. Have a listen if you get a chance...CAN YOU SPOT THE MISTAKES? There's a couple more to be added as well. Web 2.0 Apps and their use in an MFL Classroom, Part 2...Audio Resources. In this second post relating to how web 2.0 apps can help in the Foreign Languages classroom I am looking at, for want of a better term, audio resources. I have used this term loosely to include recording applications, sites to help jazz up recordings (free music and sound effects), podcatchers and even a set of rubric(s)(sp?) to help assess student produced podcasts. Again its a bit long, so please have patience and most of all I hope you find it useful. This is a super little application for podcasting, particularly if you don't have access to a computer. Why? Well because you can cast your pod by phone. Call the access number (dependent on which country you are in) record what you want to say and that's about it. If you want to know more details about how this works and some of my ideas about how to use it in a modern languages classroom you'll have to click the player to listen to it. Once you have recorded your thoughts and had them published you can share them with the world via your blog, facebook or myspace pages by embedding the player. Gcast is pretty much the same as Gabcast, except that there don't appear to be different access numbers dependent on where you live. It also seems you have to input a US telephone number as a security check. I used a friend's number which worked fine. Couldn't get it to work with my home phone. It give you 2 ways to create a podcast, i) by using your phone and ii) by uploading audio. Once you've done that you can add music to it by creating a playlist...just fiddle around and follow the links it makes no sense me just telling you here. Learning by doing! THIS ISN'T AN EDITING TOOL. Voki has had quite a lot of coverage in the edublogger world, particular with Sharon Tonner's Voices of the World project. Basically you create your own avatar and let it speak. You can upload an audio file from your computer, record directly via a microphone, phone in a message (USA only I think) or text in what you want said. From an MFL point of view this is a superb application. It allows students the creativity of designing their persona and it also allows them a certain level of anonymity...great for the shyer members of the class. Kids get a kick out of seeing a cartoon like figure talk with their own voice. vozMe is quite a nifty little tool. I transforms text into an mp 3 file that you can listen to or download. Obviously its a computerised voice, but it is still of reasonable quality. Here I copied the first couple of paragraphs about Spanish from Wikipedia and created the mp3. Ok not strictly a web application, but this is the portable version of the very popular and super useful audacity audio editing software. By portable this is a version you can carry with you wherever you go on a flash drive. Just download it and transfer it to your pen drive (along with the Lame MP3 encoding file.) You can then quite simply use audacity on any computer, unless of course you work in a school and even as a teacher you are not trusted to upload anything onto the empty 60gb of hard drive you have available...oooppps a touch sarcastic there! A simple way of hosting your podcasts. In the free version you get 500mb storage, but you can pay and get more. Podomatic alows you to upload your podcasts to their servers, and it then creates a feed for them to enable listeners to subscribe. Aside from hosting your podcasts on a blog style page, podomatic lets you embed episodes in your own blog. In an MFL context, this is a great way of storing students audio work, which enables the wider world to listen and comment on it. I think podcasting is one of the best things we can do in language lessons as it encourages Speaking and more importantly give the Speaking a purpose and an audience. Therefore anything which can facilitate this is most welcome. 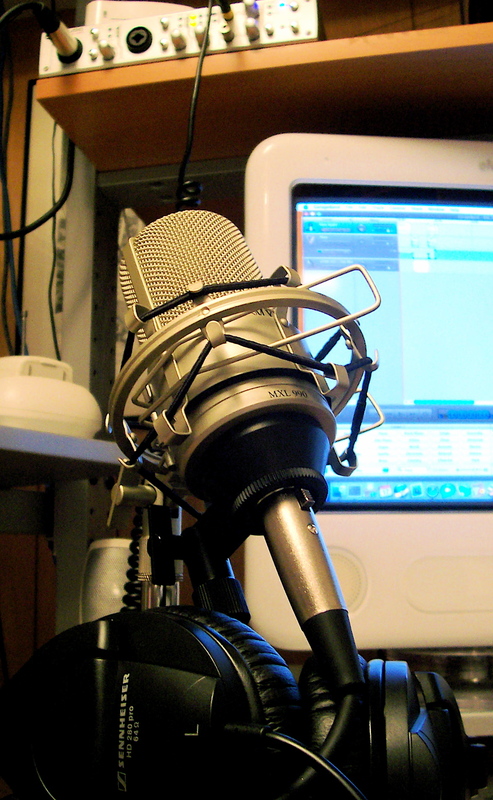 Joe Dale uses podomatic to host his students' grammar podcasts. Here I've created a channel for my son's funky times table podcasts. I chose this site more as an example of what could be created in podcast form, rather than a specific application. This site features downloadable audio guides to cities around the world. What I like about this site is that anyone can contribute. I therefore thought it would be a fantastic way of getting kids to use their language skills to prepare audio tours of their own area, for foreign visitors. This would also incorporate so many different skills and curriculum areas (eg history); involving planning, preparation, scriptwriting, proof reading, recording and editing. And of course providing a real purpose and audience for their work. Obviously students could just as easily upload to their guides to their own blogs, web spaces. This is a superb site not only for podcast production but for listening to new music. All the music on the site is free to download, as long as you cite the performers appropriately according to the Creative Commons licence under which the work is registered. As we are not supposed to use copyright music from the charts to funk up podcasts, the music from this site can be used. Ok so its not chart stuff, but if you are producing a podcast to highlight the rules for French -er verbs, you wouldn't want Marylin Manson to growling away whilst you speak. Search jamendo for some nice French accordian music to set the scene. If you check out my presidential widget in the top left of this page the track on that came from Jamendo. Similar idea(ish) to Jamendo, but this is pretty much all instrumental stuff and all composed by the same bloke (Kevin McLeod.) There are some nice stress free tunes to add as backing to your podcasts and again they don't cost a penny, unless you want to make a donation. Again you must credit the composer somewhere or somehow in your podcast. Kevin even tells you how you should do this in the FAQ. For those of you unlucky enough not to have a mac and and so be unable to use garageband, soundsnap is for you. It's an online library of thousands of downloadable sound effects, loops and weird noises. Most can be downloaded in either wav or mp3 format. And guess what? They're free, and they are all original. Specially recorded for the site by users. Obviously it could be a bit of a chore to find what you want but there is a tag cloud to help give you an idea. It could just be a great source of funny stingers for students to add to their podcasts. Once they are downloaded, just import them to your audio editor (eg audacity) and BOING, WHIZZ, POP you have a souped up podcast. Now then you've done all that work and got your students hard at work producing aural masterpieces just itching to be released to a waiting world, you still have to assess them in some way shape or form. One way, if you don't have to produce any formal assessment is to get your kids to assess each other. Peer assessment. AiFL in action. However maybe you need to assess the work in some formal way. Ann Bell of University of Wisconsin drew up an assessment rubric for podcasts. Obviously this is aimed at university level students, but the ideas are there. If you wanted to use it in an official capacity I think you would have to obtain her permission as the rubric is copyright. So that's my take on audio resources. Let me know what you think.